As the planet marks World Environment Day, protesters in Kenya took to the streets to demand the government stop building a coal power plant in the country. 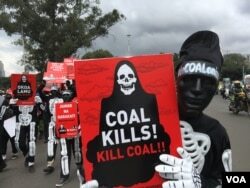 Donning skeleton costumes as symbols of death, protesters chanted "No coal, it's poison," as they marched in the streets of Nairobi to demand the government halt construction of a coal plant in the town of Lamu. Khalid Hussein of the national human rights group Haki Africa and one of the protest organizers, said the demonstrators’ message is to President Uhuru Kenyatta. “We want to send this message very clearly to the president of the Republic of Kenya that we say 'no' to coal. Coal is poisonous. Coal kills. We cannot allow this project to proceed. For China, that is also supporting and funding this program, we are asking them to take this project to their country,” Hussein said. The coal power plant, which is estimated to cost $2 billion, is waiting for the green light from Kenya's environmental court. The plant will be constructed by a Chinese company, China Power Global. Kenyan officials insist the plant will help meet the country’s growing demand for electric power. The country's environmental agency has accepted the plans, saying all environmental concerns were considered. Critics, however, believe such a project will pollute the environment and damage the marine ecosystem. Feisal Mohamed, a Lamu resident, says Kenyatta should halt the project. “We want him to realize Lamu is a beautiful place. We have good beaches, good environment. Lamu people are Kenyans like the rest, and we have the right to have a clean environment,” Mohamed said. The coastal town is designated as a UNESCO heritage site for houses that were built from coral stones and their carved wooden doors. Another protester, who asked not to be identified, said there are other ways to generate power and create jobs. Protesters ended their march at the parliament building to submit their petition. Ali Wario, a member of parliament and a member of the environment committee, accepted the petition. “We promise, as a parliamentary committee, we are going to look into this and [take] necessary action as your representatives. You do not have to worry. And when the committee is meeting, you will be invited to speak,” Wario said. Chinese companies have either developed or financed more than 200 coal-powered plants around the world, according to the Global Coal Tracker, an environmental activist group.